Olympus announced a new Micro Four Thirds camera tonight, the E-PL2. I've had one to play with for a little while and I've got a hands-on article with a video posted. The E-PL2 isn't dramatically different from the E-PL1 but some of the new features are pretty nice. Just as I was about to order a NEX 3, Arggg. What to do? You state it is more set up for inexperienced photographers, can you shoot in manual or aperture priority easily? Does it navigate through settings ok? Can you get a kit with a prime and is this the same sensor as the E5? Looking at the Oly site it has the same sensor as the 620 just a new processor. Probably lower noise. I wonder why it isn't going to be packaged with a prime too? I checked and the manual isn't avaliable for download yet. I'm wondering if the AF is improved.....and what other "improvements" are there - any to qualify an upgrade? I would actually get this one over Sony NEX series, the lens that they put on this camera was the lens they put on EPL1 on japan and it is a limited version. I made my switch to the E-PL2. I actually owned a NEX 5 for about 2 weeks. Nothing really bad to say about the photo quality. Very good lenses and the video is unsurpassed in my opinion. 3. Interchangeable lenses of comparable quality at a fraction of the cost (IMHO). 4. E-PL2 design is more natural to hold for me. These are the main reasons for me. Plus you can mount a VF-2 on an EPL-1, EPL-2 and it makes all the difference in the world when shooting in bright sun. But I still want a NEX. 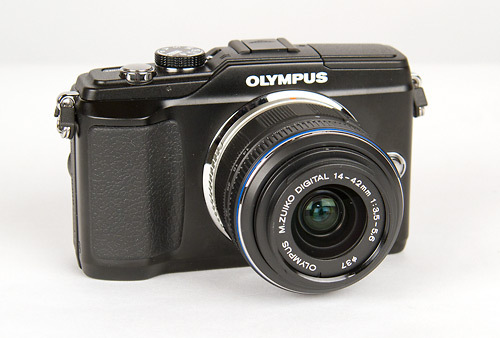 Olympus E-30 In Da House - Video!